We’ve been experimenting in the kitchen! When I read out the recipe for garlic soup in David Tanis’ One Good Dish, Pete was instantly intrigued – so much so that he hotfooted it down the road for some Aussie garlic and sage leaves. It’s a really interesting dish – a stock is made from simmering two whole heads’ worth of garlic cloves with sage and a little salt for just fifteen minutes. Then an egg is poached in the liquid and it’s served with a submerged slice of sourdough toast. I tried Tessa Kiros’ traditional Greek taramasolata recipe from Falling Cloudberries. I’m sure I’d love her books more, but the print in the two that I own is so faint that I have trouble reading them without a bright light. After chatting to Cate at Black Forest Smokehouse, I thought I’d try making chorizo rice. Finally, I tried my twisty bread again, this time using the Portuguese lard and pimenton. This batch was even more popular than the duck fat version! I hope you’ve all been having fun in your kitchens too! The garlic soup looks very interesting! Might have to try it. Looks fairly simple. Tasty looking rice and chicken. Lots of tasty, interesting foods in your kitchen! Thanks darling. It was a fabulous week, and I’m quite sad now that they’ve gone.. There is always something going on IYK Celia. Have fun with your family. Thanks G! We had a wonderful time! Oh my! Look at the size of your lemons! :o And that garlic broth sounds amazingly good especially for someone that is sick with a cold or flu. They’re enormous! I’ll bring some for you next time, the tree is laden! Yes, am interested in that garlic broth also and have not made taramasalata for ages: now to get some roe!! Love the stuff! And I do hope you have a wonderfully warm family togetherness period coming up: all the best!! Thanks Eha! We had a wonderful week with them! Yum :) I’ve done an onion stuffed chicken but not lemon… hmmmm. I finely chopped one of your wonderful chorizo, added it to sauteed onion, chopped tomatoes & a bulls horn pepper and basil, and simmered it for almost 2 hours, serving with [bought] goats cheese ravioli for an easy Saturday night dinner from ingredients to hand. You are a constant source of inspiration! I am the proud new owner of a brand new oven and gas cooktop… so I will be looking at your archives for ideas for cooking all manner of things in it! The oven was ‘christened’ with a lamb roast, delish! Only one casualty so far, and that was a loaf of sourdough…. will have to revise my cooking times and temps I think! Dear Celia, I hope you have a good time with your sister and family but I suspect that you will still be producing some fabulous food from the kitchen and we are in for a treat or ten when you return. Francesca, you’re very kind, but not a huge amount of time spent in the kitchen over the past week. Well, except to madly confit everything in sight – post is coming! :) Are you home yet? Should I mail you some sourdough? I’m home! Its a mixed blessing. I have the little ones visiting and new art on my Fridge! Daisy just brought three eggs in from the chookhouse and was so excited. So it is good being back, despite all the housework building up. And, YES please, I would love some sourdough starter. Time to get cracking on the bread. It’s glorious. Spent the day in France buying cheese and wine with John who’s visiting us right now. Not cooking at all, actually. :) My sister doesn’t cook! I think the David Tanis cookbooks are a treat! You’ve really done some outstanding experimenting in your kitchen. That garlic soup is something special. My goodness Celia, you have been busy but you really rocked all of these! I really want to try that garlic soup…but then I also want to try that chorizo dish also. I abused chickens myself – both with the lemon stuffed inside (I think I probably cut mine) and then with the beer can. I really didn’t think the beer can chicken would be all that great, but it really was very moist & tasty. mmm, what a neat idea, that garlic stock. I may have to try that in the autumn when we get some nice fresh local garlic. 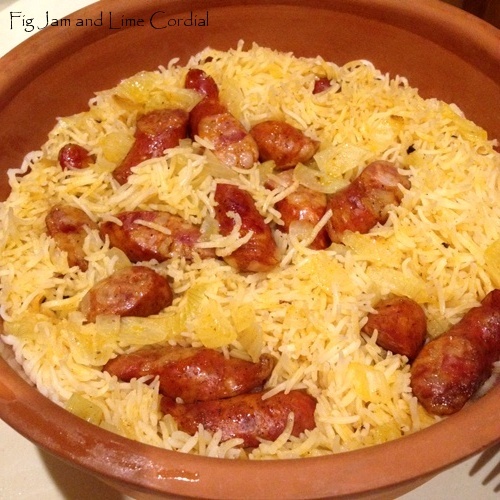 And the chorizo rice…I know that would be a hit here. I thought you always had to soak the Romy? I had a good giggle at your poor little chook stuffed with that large lemon..thanks! Bernie, I always soak the Romy before it goes into the oven, but it doesn’t seem to need it before use in the microwave. Becca, there’s nothing better than congee – my mother made it for breakfast all the time when we were growing up! I remember making garlic custard quite a few years ago and it was lovely. The roasting of the bulbs before adding left it mellow and subtle. This reminded me of that. What yummy looking experiments! Swim is almost over, I am looking forward to having more time to prepare dinners and not have to pack them and eat at a swim meet! This was our first summer with the two older boys on swim team. Luckily they practice at the same gym where I workout so it wasn’t too inconvenient! I am in love with the garlic soup with eggs. I can imagine how delicious and light it is. I am so trying this. I think it will be even better with new season garlic!